« Who are the Greens? Why are we running a strong presidential campaign? (PHILADELPHIA) Green Party presidential candidate Jill Stein and her vice presidential running mate Cheri Honkala were arrested today during a protest at the offices of mortgage company Fannie Mae on Banker’s Row in Philadelphia. Among those arrested along with Dr. Stein and Ms. Honkala were labor lawyer James Moran and Sister Margaret McKenna of the Medical Mission Sisters. An attorney who supports civil disobedience cases is providing legal assistance. All of those arrested are expected to come before a judge on Thursday afternoon. At that time bail will either be set or they will be released on their own recognizance. 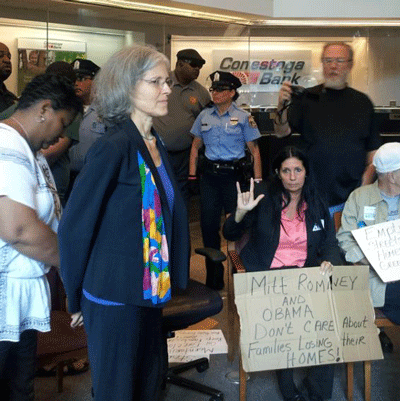 At 1pm today about 50 protestors gathered outside of Fannie Mae’s Philadelphia headquarters. They heard from Miss Fran and Rhonda Lancaster, the heads of two families evicted by Fannie Mae in its refusal to negotiate an alternative to foreclosure. Fannie Mae executive Zach Oppenheimer had previously promised in writing to meet with the two women in order to discuss other options. 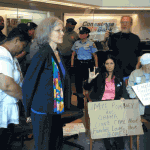 Yet no followup meeting ever took place, and so protestors today entered the Fannie Mae building and vowed to stay until Mr. Oppenheimer’s word was honored.